BBC’s The Casual Vacancy miniseries, reviewed: Why it’s infinitely better than J.K. Rowling’s book. 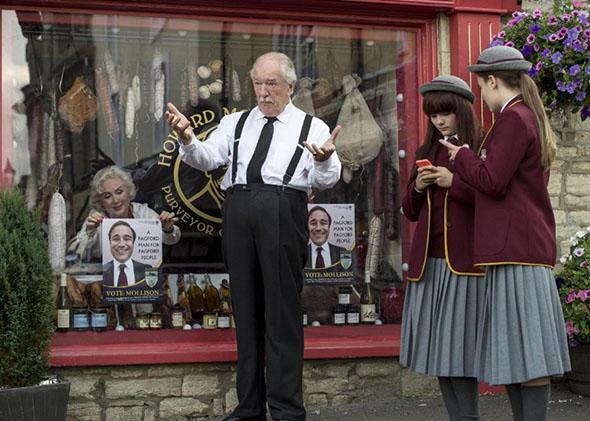 The BBC’s Casual Vacancy miniseries is infinitely better than J.K. Rowling’s book. Michael Gambon in The Casual Vacancy. The BBC’s miniseries adaptation of The Casual Vacancy, a pungent, unhappy novel-for-adults by J.K. Rowling, has an especially formidable bundle of expectations to clear. Like any television retelling of a book, it must do right by its (difficult) source material—then factor in the reflected glare of the Harry Potter properties. You might anticipate something gun-shy or self-conscious from this three-hour miniseries, directed by Jonny Campbell from Sarah Phelps’ screenplay. Instead, it’s a confident drama that takes the flaws of Rowling’s book and turns them into virtues. The Casual Vacancy’s surefooted opening sequence rushes from shots of lush, pastoral England—leas, sheep, spires, straw, the works—to less picturesque frames: a teenage boy ogling the display window at a lingerie shop, lewd graffiti scrawled over the portrait of a town forefather at a halfway home. Underneath it all ripples Solomon Grey’s hypnotic, minor-key score. The show instantly creates its own atmosphere, a sadder and lovelier version of Rowling’s dyspeptic narrative. It will still bombard you with human stupidity and folly, but you’re likely to spend as much time mourning as judging. The town is Pagford, a would-be Arcadian farming village riven by deep class divisions. On one side: the reactionary conservative bigots emblematized by delicatessen owner Howard Mollison and his wife, Shirley (Michael Gambon, here the anti-Dumbledore, and a deliciously vile Julia McKenzie). On the other side: the poor, and their good(ish) guy allies, cleaving to a handful of stereotypes—steely wives schooled in compromise; clownish, well-intentioned husbands; and a sprinkling of kindhearted minorities. Chief mensch, and most appealing of the lot, is local lawyer Barry Fairbrother (Rory Kinnear), a heart-meltingly decent advocate for the town’s destitute and meth-addicted—and the deciding vote on the parish council, which as the story opens is deliberating whether to convert a community center and addiction clinic into a luxury spa. His death (car lot, aneurysm) kicks off the main conflict: Who will take his spot in committee, stoogy Miles Mollison (Rufus Jones), a pawn in his parents’ toxic scheme for Pagford, or Colin Wall (Simon McBurney), a fearful asthmatic with nobler dreams for the community but no balls to carry them out? The dark-horse candidate, Richard Glover’s Simon Price, is Fairbrother’s foul half-brother. He abuses his son Andrew, sensitive and searching in Joe Hurst’s portrayal, and is just one of the menacing presences crowding around the town’s troubled kids, who serve as the story’s moral center. Because, in true Rowling fashion, the heart of the matter is the kids, despite the grown-ups’ scenery chewing. That’s in part due to newcomer Abigail Lawrie, whose magnetic performance as Krystal Weedon, wary daughter of a drug addict and devoted caretaker to her younger brother, Robbie, is a standout. She is all sharp edges, narrowed eyes, and funny, alert sweetness. When “Barry Fairbrother’s ghost” begins posting damning secrets about the candidates to an online message board, Pagford tears itself apart with gossip and petty scandal. But Krystal’s storyline reminds us that the true stakes of the show are much higher—that, should the wrong guy win the election and the meth clinic close, the cost is not simply that odious people might get unjustly rewarded. It’s that good people will suffer. Of course, I’m hardly spoiling much when I say that good people do a lot of suffering in The Casual Vacancy regardless. (Given Rowling’s yen to rub salt in the wounds of the salt of the earth, I’m surprised Campbell didn’t score the closing credits with Billy Joel’s “Only the Good Die Young.”) When the book came out in 2012, readers found it sour, dingy, and brutal, if veined with flecks of wry humor. Those who haven’t dragged themselves through the novel might have a hard time believing that the TV version is far less grim than it could have been. The tragic arc of the story survives, but plot points that felt gratuitous on the page have been softened or omitted on screen. And artful, textured performances from Albion’s finest thespians make even the ghoulish caricatures seem a breath more human. But I appreciated the miniseries’ willingness to reach beyond moral satire. There are glimmers of big cosmic tragedy in this Vacancy, when the camera swings away from two characters arguing (or hooking up) in order to highlight some mythic element in the landscape. Or Campbell will linger on a wall hanging of fairies and toadstools to suggest enchantment, or he’ll underscore a resonant coincidence—the same jogger by the pond, the same piece of discarded electronics. The show offers surprising glimpses of the fantastic, in the form of prophetic dream sequences and momentary hallucinations. Some of its most powerful—and chilling—scenes involve a skull-faced scarecrow loping around with a scythe, or the eminently lovable Barry Fairbrother turned sinister on his way back from the grave. And indeed: Is there any trope more terrifying than a beloved character made unrecognizable by death? If The Casual Vacancy has a theme apart from “Don’t be an unethical hypocrite wretch,” perhaps it’s the all-consuming fact of mortality, the brutishly casual vacancy that awaits us all.